Several weeks ago (maybe months?) 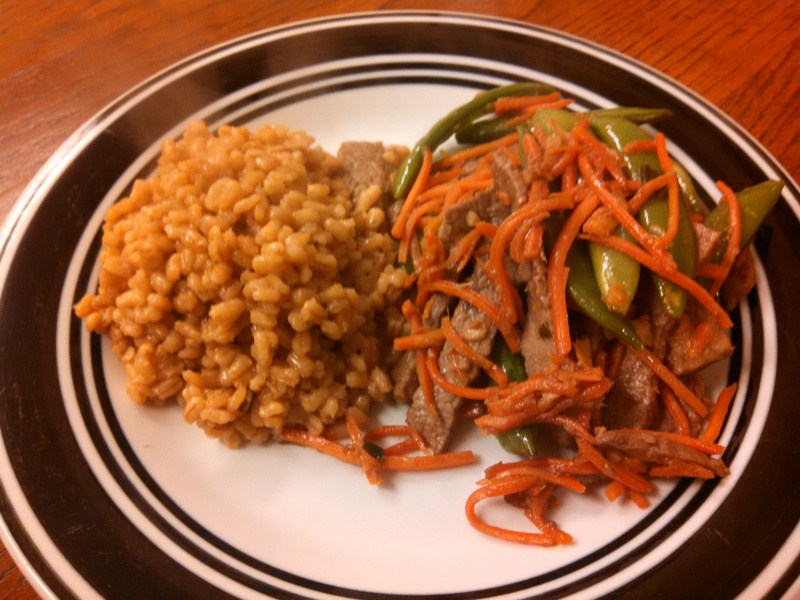 I made this delicious WW-inspired orange beef and barley pilaf from food.com! It was pretty simple and tasty. The pilaf, I must admit, was my favourite part. I don’t use barley very often (aka ever), but I had some left over from a beef and barley stew I made awhile back, and it is a nice change-up from rice, pasta, and quinoa. I wish I could remember more about this dish, but I didn’t really change or edit much, though I might have added in more spices or sauces to amp up the flavour (I’ve found that some WW recipes unnecessarily skimp on flavour). Enjoy! -Spray a large nonstick wok or skillet with nonstick spray and set over high heat. When a drop of water sizzles on it, add the scallions, garlic, ginger, and orange zest. Stir-fry until the scallions soften, about 1 minute. -Add the beef and stir-fry until browned, about 3 minutes. 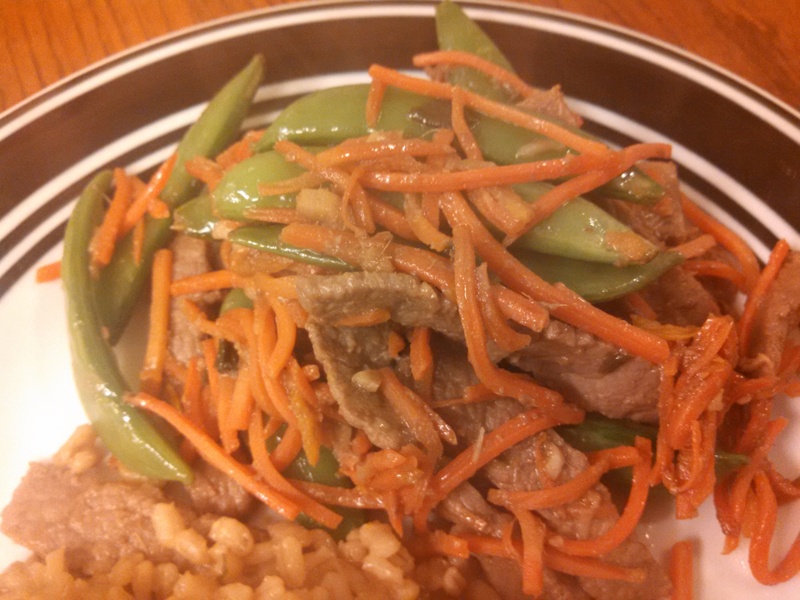 Then add the sugar snap peas and baby carrots, and stir-fry until crisp-tender, about 2 minutes. Stir in the soy sauce and orange juice, then bring to a simmer and cook for about 20 seconds. -Meanwhile, mix the cornstarch and water in a small bowl until smooth. Add the cornstarch mixture to the wok and cook, stirring constantly, until the sauce is thickened, 30 seconds (at this point, I felt this was a little unnecessary, as it wasn’t overly thick to begin with, but use your best judgment). -Bring broth to a boil in a saucepan, then add quick-cooking barley. Simmer, covered, for about 12 minutes (my barley was not quick-cooking, so I had to adjust my cooking time). -Spray a skillet with nonstick spray and set over medium-high heat. Add mushrooms and cook until tender (you can do this without mushrooms – I just used whole ones, for my husband, but I picked them off my dish). Add the barley and soy sauce. Then serve.